You use the following Maintenance ⇒ Main Options window to specify some options for the program. The checkbox for Hide Account Numbers except in Chart of Accounts determines whether account numbers are hidden in most places in the program, such as drop-down lists of accounts, reports etc. It defaults to not being checked (account numbers not being hidden) if you have not changed it in this window. The account numbers are always displayed when you are maintaining the chart of accounts. The checkbox for Show Cents in Reports determines just that, whether the cents (or decimal places in countries where the currency is not called "dollars" and "cents") are shown in all quantities in reports. It defaults to being checked (cents are shown) if you have not changed it in this window. Please note that even if this unchecked, all additions of totals and subtotals in reports are still done with all decimal places in the amounts, so occasionally those totals that show only the full dollar amounts may appear to be slightly incorrect, because of rounding differences between the numbers making up the total and the total itself. The checkbox for Don't Indent Amounts in Reports controls the indenting of the amounts in reports such as the Income Statement and Balance Sheet. If this is not checked (which is the default), and you have defined sub-accounts and perhaps sub-sub-accounts in your chart of accounts, the account names are indented further to the right as you go down those levels of accounts in such reports, and the amounts are indented further to the left. If you instead check this checkbox, the account names are still indented, but the amounts are all level with each other vertically. One reason you might want to check that checkbox is if you are planning to use the Save As button in the report window to save the report as formatted Excel. For reports that are affected by this option, when there are indented amounts, the underlining does not come out well in Excel, due to a bug in the software that ACCOUNTS uses to do the exporting. When the indenting is removed by using this checkbox, the underlining looks fine in the Excel exports. The checkbox for Give messages about due and overdue bills on program startup determines whether you will be shown a message box every time you start ACCOUNTS, with an option to go to the Pay Bills window, if you have bills entered with the Enter Bills window that are due today or overdue. It defaults to being checked (showing such messages). The checkbox for Print Account Names on Cheque Vouchers refers to the 2nd and 3rd (voucher) parts of cheques printed from the program. Those sections of the cheques include a list of the split account(s) for the cheque transaction. If you uncheck this checkbox (which defaults to checked), the account names are omitted, and only any memos and the split amounts are printed. The checkbox for Drop down Account fields on entry to them determines whether, in the data entry windows where there is a field for selecting an account, those fields immediately drop down their list when the focus moves to them. (That could be either because they are the first field on a window, or when you Tab to them.) This defaults to checked, but if you don't like that behaviour, you can turn it off. If you turn it off by unchecking this, you can still drop down that list either by clicking on the field with your mouse, or using the keyboard combination Alt+DownArrow. The checkbox for Don't prompt before open Register Splits window with Ctrl+S determines whether, when you press Ctrl+S in a transaction in the Register window, it immediately opens the Register Splits window (if it's checked) or asks you to confirm doing so (if it's unchecked). The default if you haven't changed it is unchecked, so it does prompt. 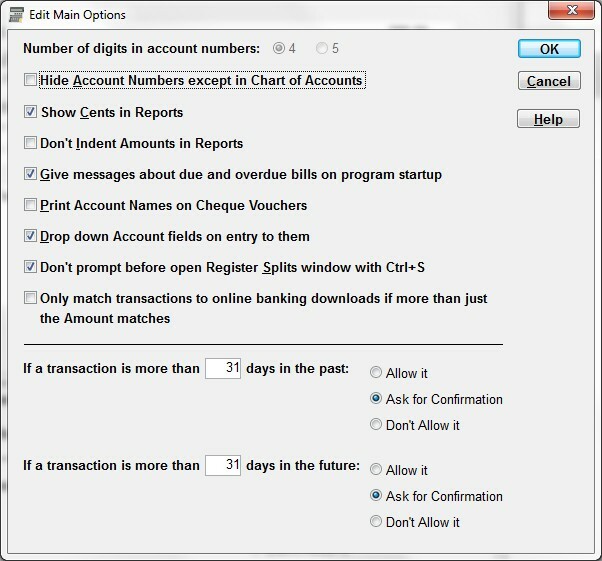 The checkbox for Only match transactions to online banking downloads if more than just the Amount matches determines whether matches can be made when importing downloaded online banking transaction files if nothing other than the Amount matches (not the Description, or a cheque or reference #, or a bank rule on the Description). Check this checkbox if you have a lot of transactions with the same dollar amounts, and find that the automatic matching is making too many incorrect matches. The settings in the bottom part of the window allow you to control whether the program warns you about entering transactions whose dates are too far in the past or future, or even prevents you from entering such transactions. The default, if you have not changed the settings in this window, is as shown in the sample window above: Ask for Confirmation (i.e. warn) if a transaction is more than 31 days in the past, or the future. These settings apply to everything in the program except for the option to add interest or service charge transactions on the bank reconciliation window. Please note that if you have multiple databases for multiple organizations, all of the settings on this window are specific to each database (they do not automatically carry over from one to another). When you are done making changes, press Enter or click the OK button to save your changes. Pressing ESC or clicking the Cancel button reverts back to the unedited version of the Main Options.